Have you ordered something online which doesn't require a signature, however your letter plate is too slim to fit the parcel through, or your mailbox is too small? You no longer have to worry about taking a morning off, or working for home, just to make sure your parcels get delivered safely...a secure parcel box is the answer! Our parcel dropbox is ideal if you are expecting more than one delivery a day, as the system design allows each parcel to drop down inside the box once the lid is closed, into a locked galvanised steel box, which is only accessible to the key holder. The parcel box should be fixed into the ground to ensure no-one can steal the entire box. We supply a whole range of large capacity postboxes, letterboxes and security boxes to ensure your mail remains protected. Whether you're receiving residential or commercial mail, our parcel box is the perfect solution to online purchases, which are being increasingly popular by the day. Why pay a delivery charge and worry about using fuel having to collect it from a post depot when missed? 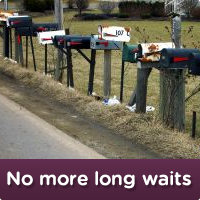 You can guarantee you'll be able to arrive home to your parcel waiting securely for you. Select any of our product images across the Website to view detailed box dimensions, and make sure your parcels will fit. If you have any questions about our range, please do not hesitate to leave a comment below and we'll get back to you as soon as we can, or simply call us today.